Amish teenagers experience and embrace the modern world as a rite-of-passage before deciding which life they will choose. A dangerous schizophrenic murderer goes on a murderous rampage around London whilst holding a woman hostage. An uproarious mockumentary about the British film industry. 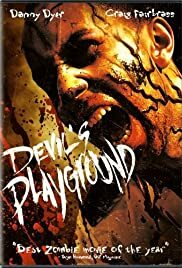 "Devil's Playground" is basically a complete rip-off of Danny Boyle's 2002 horror masterpiece "28 Days Later". Same basic concept; fast-moving infected (not actually zombies as such)on the loose in modern day London and a group of individuals trying to escape the horror, fighting amongst themselves on the way. The one thing it doesn't borrow from it's source material is any level of intelligence. The characters are melodramatic clichés and way too good-looking and well-groomed to be in any way realistic; even though it's a low-budget British film it unfortunately follows the crap Hollywood template of shallow, unbelievable, glamorous leads stuck in an increasingly over-the-top set of action-based scenarios. Still, if you just want to watch something empty-headed and fun then it's not all bad. The stunt sequences are well done and the movie is nicely shot, with some fantastic views of London on display. Don't take it too seriously and you'll have a good time. 64 of 88 people found this review helpful. Was this review helpful to you?